Hey, if it worked with Denmark and the Mo’toons hoax! 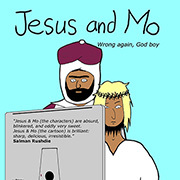 Can’t imagine anyone in Europe now publishing cartoons of Mo. 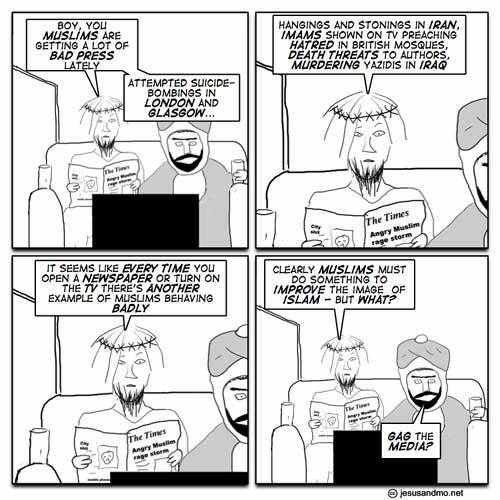 I wishi I could send these cartoons to my daughter working in Qatar but she would be stoned if anyone found out she was reading them. Europe wasn’t too different until 1900’s. Gays were imprisoned, women had far less power. In earlier times even “witches” got hanged in Salem. Diagnosis: Education and shifting of powers are the cure. Shift the power from state and big conservative businesses to more liberal environment and encourage liberal teachings. Tony Blair in Britain encouraged ‘faith schools’ and academies run by wealthy religious organisations. His aims included creating a couple of hundred state-funded islamic schools, and he was happy to see the teaching of creationism at Peter Vardy’s christian schools in the North East. ‘Give me the child until he is seven,’ the Jesuit saying goes, ‘and I’ll give you the man’. Turning all the semi-enlightened people to again, misogynistic, homophobic, sexist pigs? I think it was Karl Marx who made a simlar comment as the Jesuit has made. Paraphrasing: Give me the child for his first seven years of his life and I will have him for his whole life. In short, let the government have your children from the beginning to adulthood and you have the best followers of government in the world. My suggestion, get the federal (upper echeleon of) governments out of the schooling business, let the lower governments and communities decide what is best for their schools and you will have more free thinkers coming out of them instead of adult automatons that just do and follow instructions from the government overlords.